Celebrate National STEM Day at Wheels Skate Center! Sometimes, it’s difficult to get kids excited about learning something new. However, when you combine fun and education, learning new things will be a blast! Fortunately, roller skating is an incredibly fun activity that has learning opportunities fused within it. From science and technology to engineering and mathematics, roller skating centers are the new classroom! 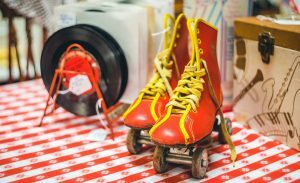 Discover more about roller skating and how it correlates to education and positive family behavior. Millions of kids across America roller skate every year, and they don’t realize they are putting education into action! When you roller skate, you are using the different aspects of science, technology, engineering, and mathematics (STEM). In order to skate, technical components such as friction, acceleration, inertia, and velocity must take place. That means that roller skating isn’t just an incredibly fun activity – it’s also a learning opportunity for the whole family! Wheels Skating Center is celebrating STEM on National STEM Day – November 8th! Take this opportunity to teach your kids more about STEM while enjoying a fun family outing. Roller skating is a great family activity that has a number of benefits. When you skate with your family, you’re making memories, getting great exercise, and changing up your regular routine. Kids love to skate at Wheels because it helps them release pent-up energy from a long day at school. And skating (and skate education!) is a great activity for all ages. Mark your calendar for National STEM Day and bring the entire family to Wheels Skate Center to celebrate! Check out our fall hours.